Villager beaten in sand mining dispute On June 23, 2018 a dispute was reported between the Pradhan of Pakrari Gram Panchayat and a villager over illegal mining in Kanhar river in Sonabhadra’s Kadamganj police station area. As per report the villager was beaten and after the assault, both of them were taken to the police station. 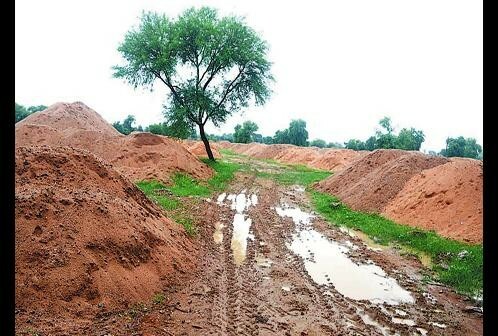 Bundelkhand Police-Politicians-Mafia nexus silences everyone with money or might This detailed report by Khabar Lahriya reveals how the nexus between sand mafia, police and politicians has been looting the sand from the rivers. Media persons who object to this are either paid money or killed for not falling in line. Having no choice left, the reporters also are helpless and become part of illegal nexus. Murders mere collateral damage to thriving sand mafia Banda is particularly rich in sand because of the rivers Ken, Bagen and Yamuna that flow through it. The 2017 district survey report of minor mineral excavation recognised 7688 ha as potential sand mines. The report stated that 1408.13 ha land was being used as mines or had already been proposed for mines, 4653.35 ha land was left to be capitalised on. According to the same report produced in conjunction with the UP Environmental Impact Assessment Authority and Department of Geology & Mining, although sand production has seen a decline from 11,36,260 cubic metres in 2014-15 to 61,250 cubic metres in 2016-17, the last year raked in Rs 62 lakh in revenue just from the district of Banda. Although official records state that sand production has actually fallen, this data actually belies the facts. While there is no official data on illegal mines, obviously, former Minister of Mines Piyush Goyal had said in a Lok Sabha session that the number of illegal mines have increased from 6,777 in 2014 to 11,350 in 2016. Govt book 3 of its officers for sand mining in name of ‘eco-restoration’ Following May 2018, Hindustan Times report, the state govt lodged a police complaint against three top forest officials for calling tenders for mining sand in reserved forests, which can’t be done without the Centre’s permission. As per the FIR, lodged by state’s special secretary (forest) Om Prakash, the Uttar Pradesh Van Nigam (forest corporation) without taking the approval of the state and the central government and in violation of norms sought e-tenders for sand mining in the name of eco-restoration of forests along the rivers. Yamuna Illegally mined sand put back in Yamuna It was very interesting that to save ancient Sujawan Dev Temple, illegally mined sand was put back in the river Yamuna. 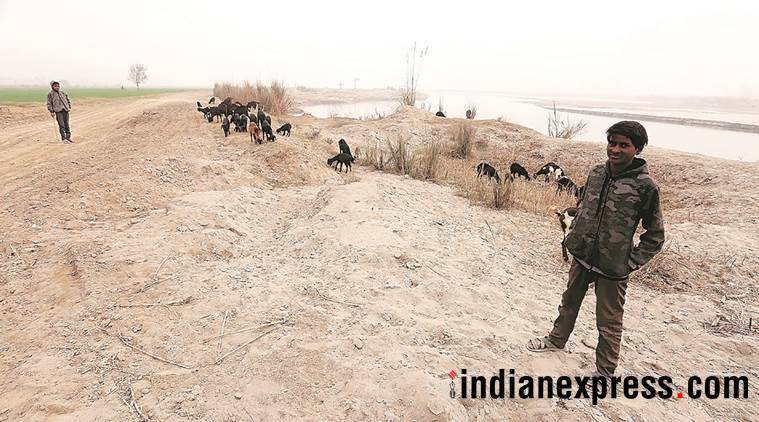 15 arrested for sand mining on Yamuna riverbed near Noida A joint team of officials from the Gautam Budh Nagar district administration, police and UP PCB on Feb. 19 arrested 15 persons for illegal sand mining on the Yamuna riverbed. They also seized 15 tractors, three earth movers, two grinders, two motorbikes and an SUV. Illegal sand mining operation busted, excavator machine seized In April, 2018, police raided an illegal sand mining operation along the banks of the Yamuna in Shamli district and seized an excavator machine. The raid was conducted after police received a tip-off regarding the sand mining mafia operation in the area falling under the Jhinjhana police station in Shamli. DM announced NSA against Bhupendra Singh also, who along with his father allegedly killed power department employee at Dhoom Manikpur substation. SP (rural) Ashish Srivastava said that the arrest of Bhupendra will break the backbone of the illegal sand mining in the area. However, within two hours of the announcement of the arrest, Bhupendra got bail from the district court. As per sources, the administration had been planning to invoke the NSA against Bhupendra too but the bail order proved as a setback for the administration’s efforts. Public Hearing Notice on sand mining proposal in Yamuna Public Notice has been issued by UPPCB regarding Environment Public Hearing of sand mining proposal at Belakalan village on Yamuna bank in Gautambudh Nagar, to be held on 5 Oct. 2018. Surprisingly instead of providing relevant documents among concerned citizens and villagers, it just informs that they are available at DM & Tehsil Sadar office, Gautambudh Nagar, MoEF regional office Lucknow, UPPCB office, Lucknow & Greater Noida etc. CBI Role of former UP CM Akhilesh in illegal mining to be probed After conducting raids at 12 locations in Uttar Pradesh and Delhi, the Central Bureau of Investigation (CBI) said that the role of former UP, CM Akhilesh Yadav would be examined in connection with an illegal sand mining case. The case was taken over by the CBI on directions of the Allahabad HC. The residences of senior officers, including IAS officer B Chandrakala were also raided in connection with the case. The search was spread across multiple districts, including Jalaun, Hamirpur, Lucknow and also in the national capital. Adil Khan, B.Chandrakal, then mining officer Moinuddin, SP MLC Ramesh Mishra and his brother, mining clerk Ram Ashray Prajapati, Ambika Tiwari (Hamirpur), mining clerk Ram Avatar Singh, his relatives and Sanjay Dikshit are accused in the case. NGT seeks response on illegal mining in Ken & Betwa Rivers The Green Tribunal on May 8, 2018 sought responses from the Centre and the state govt over a plea alleging illegal sand mining in Ken and Betwa rivers in four districts of Uttar Pradesh. The tribunal was hearing a plea filed by Hamirpur resident Prem Singh Yadav alleging large scale unscientific sand mining in Ken and Betwa rivers in the districts of Banda, Hamirpur, Jalaun and Jhansi in Uttar Pradesh in violation of the conditions prescribed in the environmental clearance (EC) as well as the mining lease deed. NGT asks Govt to conduct surprise visits along Betwa In May 2018, the green tribunal directed “periodical inspections and surprise visits” along Betwa river banks in Jalaun and Hamirpur districts of Uttar Pradesh to keep a tab on illegal sand mining in the area. A bench headed by Justice Raghuvendra S Rathore asked the district magistrates to look into the issue of illegal mining and keep a constant vigil over the area. Stop illegal mining in 2 months In July 2018, NGT ordered the govts of Uttar Pradesh and Madhya Pradesh to strictly prohibit illegal mining in both the states. It also ordered the release of ongoing investigations related to it within two months. With this final order, NGT cleared the hearing on petitions going on for the last 5 years. Many people, including Banda’s social worker Braj Mohan Yadav, had filed petitions against illegal mining in the NGT. Only govt can permit sand mining: NGT The Green Tribunal in Sept. 2018 prohibited any permission for mining of sand and minerals at the district level, which was touted as a landmark order by environmental activists. Instead, all such permissions will now have to be procured from the state govt directly. The NGT’s principal bench, headed by chairperson AK Goel, issued the order in the wake of a petition by Greater Noida-based environmentalist Vikrant Tongad in 2016 that said sand mining on river beds was done mainly for the purpose of construction. “The tribunal has noted that extraction of alluvial soil from within or near a stream bed has a direct impact on the stream’s physical habitat characteristics including bed elevation, substrate composition and stability, in-stream roughness elements, depth, velocity, turbidity, sediment transport, stream discharge and temperature,” Tongad told media. NGT overruled govt order easing mining rules In Sept. 2018, the Green Tribunal overruled the Union environment ministry’s 2016 notifications that exempted mining of minor minerals like sand in up to 25 ha area from prior public consultation and the environmental impact assessment (EIA). The court also said that the exemption for minor minerals violated a 2012 SC order, which held that all mining leases depending on their size would need to obtain environmental clearance. The bench noted that the ministry’s notifications were in conflict with the 2016 sustainable sand mining guidelines, which said an EIA should address the environmental impacts of minor mineral mining. The ministry had amended the 2006 EIA notification and put mining of minor minerals in an area up to 25 ha in B-2 category. An environmental clearance is required under the category. But it is exempted from public hearings and EIA. The notification bypassed any detailed environmental study and only asked for basic project information. A district environment impact assessment authority was granted powers for environmental clearance for mines spread over an area up to 25 ha. Petitioner Vikrant Tongad had contended that the district level assessment authority had no scientific expertise in assessing environmental impacts. He had alleged that the 2016 notification provided an exemption of the “rigours of the necessity of EIA and EMP” for 5 – 25 ha areas which previous notifications made necessary. Red flag against 36 sand mining projects In Dec. 2018, the NGT withheld the environmental clearance (EC) given to at least 36 sand mining projects in Uttar Pradesh on the ground that it was obtained in violation of rules specified in the EIA notification of 2006. The mines, located in the floodplains of the Ken, Yamuna and Betwa rivers, had got a “Regional EIA” (REIA) done by a private consultant. Based on the REIA, many projects were granted environmental clearance by the SEIAA. NGT seeks response on sand mining in Yamuna NGT has sought response from the Divisional Commissioner, Allahabad, after a committee headed by the officer failed to submit a report on the alleged illegal sand mining in the area. The officer has been directed to be present before the Tribunal on January 22. Summary:- The above narrated reports show that several violent incidents involving illegal sand extraction took place in Uttar Pradesh in 2018. The Chief Secretary’s complaint in May 2018 resulted in FIR against three Forest Dept officials including the director of Van Nigam for inviting sand mining tenders in rivers inside reserved forest. It was a remarkable development. Invoking of NSA against dreaded illegal sand miner Sanjay Momnathal, by the district administration of Gautam Budh Nagar was unprecedented, it was first time that NSA was invoked against a sand mafia. The police was also trying to book his son Bhupendra Momnathal under same charges. There was no significant improvement in the situation of Ken and Betwa rivers which flow through the Bundelkhand region comprising Uttar Pradesh and Madhya Pradesh. Sand mafia kept damaging these rivers along with their small tributaries round the year. It continued even after imposition of a ban by NGT. However, the NGT passed several important orders to control the illegitimate extraction of riverbed minerals in UP. In a remarkable decision, in Sept. 2018, the NGT disallowed DEIAA from issuing sand mining permission observing that the body lacks required expertise. In a way, the decision rendered MoEF’s 2016 notification ineffective which exempted sand mining upto 25 ha from EIAs and public consultation. Further to this, in Dec. 2018, the green tribunal withheld EC given to about 36 sand mining projects in violation of EIA notification 2006. As 2018 ended, CBI got into action by conducting raids and beginning the probe against several govt officials including former mining minister Gayatri Prajapati and DM Hamirpur in connection with illegal sand mining scam that took place in the state between 2013-16. Previous Post DRP News Bulletin 04 February 2019: Bangladesh stops playing blindman’s buff over protection of Rivers. Will India learn?